Spencer: Global Average Sea Surface Temperatures Poised for a Plunge | Watts Up With That? by Roy W. Spencer, Ph. D.
The corresponding sea level pressure difference between Tahiti and Darwin (SOI index, next graph) shows a rapid transition toward La Nina conditions is developing. Being a believer in natural, internal cycles in the climate system, I’m going to go out on a limb and predict that global-average SSTs will plunge over the next couple of months. Based upon past experience, it will take a month or two for our (UAH) tropospheric temperatures to then follow suit. May 20, 2010 in Sea Surface Temperature, Uncategorized. A Sea-Surface Temperature Picture Worth a Few Hundred Words! There appear to be a long term cycle to intense El’Ninos; if so a prolong period at the bottom of the cycle is due. Wow! Joe Bastardi also thinks we’re headed for a deep La Nina. Could it make 08 look warm? So, what do we need to hit on the anomaly, and when, to avoid “2010 hottest year” headlines? April already showed some decrease, presumably May and June will as well, and then by July what Roy is talking about here should be kicking in. will they stay down or is this just another flash crash? I live in Rocklin, ca. It seems to me that the weather (at least in Nor Cal) the last 3 years or so has been cooler…..fall, spring and summer…..can’t tell with winter. Maybe around when the PDO changed……?? Of course this is anecdotal. Not what the Met office are pushing! This is explained by global warming. As Dr. Spencer acknowledges, there is nothing at all unusual in this kind of natural cycle (i.e. drop) after an El Nino, and exactly the same kind of fall was seen after the 1998 El Nino. The more interesting question is how low will the ocean temps go and how much will the tropo temps be affected. I doubt we’ll see the La Nina low temps we saw in 2008, though temps may fall somewhere to the 2009 low. Uh, why not just change the scale instead of multiplying the data by 10? Makes no sense to me. No, not altogether unusual, the drop to La Nina after El Nino. What Joe Bastardi is predicting is the drop to the type of La Nina’s of the 1950’s. The effect on humans will be rather pronounced, as what we are used to is 3 decades of warm El Ninos. Don’t step on my La Nina frosted Shoes. So while it is interesting to note the ENSO cycles, PDO, etc., more important for the long term climate are the longer term trends. Um…so does this mean I’m wearing shorts or sweaters this summer? Because it is uncontroversial to either side to note that 1993 was significantly cooler than 2008? Lovely Mt. Pinatubo cherry-pick there tho. There are two lines, global oceans and equatorial(5 degrees north to south). Dr Spencer multiplied the swing in the global oceans by 10 so one could see the global ocean temps track with the equatorial temps with a time small lag. That paper addresses a 1993 to 2008 thermal trend analysis. Not a long term climate trend and much less than the estimated 30 to 60 year ENSO cycles. The theory that stronger La Nina cycles will dominate for the next decade or two has interested people watching the shorter term swings. Are you betting for or against a long and strong La Nina? We are cooling, folks; for how long even kim doesn’t know. I am not really sure what you mean by “temps may fall somewhere to the 2009 low”? 2009 was a relatively warm, El Nino year. What is the basis to believe that strong La Nina would bring about equally high temperature as those produced by a moderate El Nino in 2009? Arguably more blogworthy than what Dr Spencer chose to post about …..
You expect me to read an article that starts out with the word “Robust”???? We already know there is a pseudo-60 year cycle, Vukcevic graphs it for you and so did Bob Tisdale. Bob even showed the “step function” of the ocean charging with heat after the large El Ninos. Now we seem to have hit the top of that cycle and are probably headed towards lower temperatures. This has been expected for the last couple of years and now we see the start of it. You may be right, but the drop-off in the NINO 3.4 SST anomaly is the steepest since 1998, or close to it. I shan’t get excited much either way. El Ninos are heat shedding mechanisms and vice versa. We’ll soon know. Uh Doug not all of us have a 2 meter wide monitor sitting on its side hooked up to our computers, at least until our cheques from Big Oil clear. It’s really strange for SST to be this high with SOI to so low, provided you’ve only been observing the planet for 30 years. If I were Dr. Trenberth I’d be saying “We don’t understand” right now, as per usual. And I’m wondering why you directed to a pay-per-view magazine study. Are you a Nature fan? Hmmm, can’t have that, it must be time for an “adjustment”! I would only look at studies in good scientific journals and I no longer consider nature to be one. Has anyone plotted the derivative (or best-estimate thereof) for the smoothed fit? Because that would appear to be one of the steepest 3 month periods on record from the AMSR-E instrument. I noticed that there seems to be a correlation between El Nino / La Nina events and global temperatures. More El Nino events than La Nina events give a warmer average temperature on the planet, and the temperature increases stagnate when there are approximately equal La Ninas and El Ninos. Greater La Ninas than El Ninos give a decline in planetary temperatures. However, the El Nino/La Nina data record extends only to the 1950s, so I can’t really claim it’s an historic phenomenon. What do you make of (And I’m wondering why the AGW skeptical group is not talking about) this major study? Just wondering. Would be more interesting if it didnt stop at 2008. All that paper proves is that oceans warmed somewhat between 93-2008, which proves nothing when it comes to climate. The cool PDO (20 to 30 years) has resumed, so we should see more La Ninas, weaker El Ninos, and cooler temperatures ahead, according to Joe D’Aleo and Joe Bastardi. Habibullo Abdussamatov, head of space research at the Pulkovo Astronomical Observatory in Russia, predicts that a new “Little Ice Age” could begin as early as 2014. 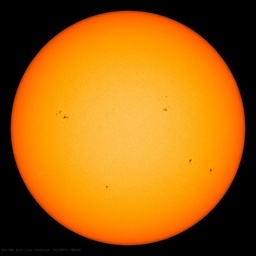 Abdussamatov says that sunspot activity should reach a new minimum in 2042, resulting in a deep global temperature minimum in the years 2055-2060. Congress needs to force the cap-and-trade bill down our throats before the onset of colder temperatures. The good news: When the cool-down finally arrives, we won’t have to hear any more global warming nonsense. It’s no record setter, but is on the rare side. Maybe 6 or 7 similar drops in the record, though I’m not sure the graph accuracy is all that good. Re your suggestion, derivatives cause a loss in plot accuracy. The error in the graph will be increased even more, so I’m not sure whether any valid conclusions could be drawn. Worth a look, sure, but mostly for amusement. The Nature paper claims there has ocean heat accumulation that translates into a radiative imbalance of .53 to .75 W/M2 from 1993 to 2008. However since 2002 Argo demonstrates no ocean heating according to Willis. Does anybody have an idea of what Argo has revealed since 2008?. Did the current El nino result in added ocean heat content or released heat from the oceans? I suspect the entire global warming movement will live or die with Argo. Forget atmospheric temperatures. The greatest source and cause of weather climate variability and long term oscillation is in the oceans and trade winds. Understand those, and you understand warming and cooling trends upon the land. C02 is a sliver in your finger compared to the forest of oceans. Uh…Kadaka…why do you equate sea surface temperatures SSTs with deep ocean temperatures? Don’t you realize they are not the same thing? Exactly Pamela, and I would add an explanation point on the wind. A calm windless stagnated ocean cannot evaporate to any appreciable amount little matter of what is the temperature, some don’t really understand the evaporation/condensation surface interface. Now add wind, linear or from convection, and then you have something happening, once again, little matter of the temperature even though it does affect the rate of course but the wind speed easily trumps it! Yeah, I enjoy Joe Bastardi too. He’s also predicting a strong hurricane season. This leads to the possibility of the AGWers pointing at the hurricanes and saying “I told you so” only then to be hit by a cold cold winter and spring. We shall see. The empirical science that hte AGWers refuse is still being done, whether they like it or not. They can only distort (sorry, adjust) the data so much. C02 is a sliver in your finger compared to the forest of oceans. Pamela, I should have added that when the wind gets high enough to break the wave tops the surface area shoots up a hugely, now with wind to carry away the moisture and a huge surface area exposed a serious amount of water vapor can be stripped away from the surface in no time, but surely everyone understands that, I realize you do. Well, maybe someone not savvy on science might read this and say, “Gee, I didn’t quite realize that!”. This would explain the enormous amount of unseasonal rain in the north of Australia the past week. It follows a 3C to 4C higher monthly average in Broome for April and nearly as much for Jan and Feb, caused by well above average sea temperatures in the area between NW Australia and Indonesia. Temperatures so far for May are almost back to the monthly average following this rain. I assume Trenbarth’s statement that 50 % of the heat is missing is based on the .52 w/m2 radiative imbalance inferred from the ocean heat content accumulation curve from 1993 to 2008 as discussed in the Nature paper when compared to the 1 w/M2 radiative imbalance estimated from the Ceres Satellite data. However from 2002 to 2008 the Argo data shows no accumulation. Since 2008 the arctic ice cap has rapidly grown and is probably releasing heat at .2 w/m2 which would then need to be subtracted from any heat accumulation since 2008 gained from the current El Nino. With the impending drop in SST I bet Argo will ultimatly reveal heat loss since 2002. The anomalous step change from 2002-2003 is a step change (3.5 deg) during the transition from XBT to ARGO, something which Josh Willis has acknowledged in exchanges with RPS, yet mysteriously is not mentioned in the Nature article. These pro-AGW advocates just can’t bring themselves to to admit things are not working out as planned. This study is confirmation of predicitons made by AGWT about the warming of the oceans using multiple data sets. It is not a landmark study, but for those, like me, who remain 25% skeptical about AGW, it begins to nudge me further down the road. This might be of interest. Can’t put images up directly so here is a link. If you took out the step change I bet the calculated radiative imbalance calculation would drop to something like .3W/m2 – even more missing heat. There is more to climate oscillation than ENSO in the long term, so the cooling Dr Spencer is predicting is likely more than just a post-el Nino reflex. Since change in OHC is likely predictive of SST and tropospheric temperatures, and OHC has been dropping for a decade or more, a more sustained temperature decline is indeed probable. The tropospheric temperature record since the 1998 el Nino looks curiously symmetrical – two similar peaks (1998, 2009) separated by a plateau. This symmetry can be expected to continue on any rational basis – i.e. with falling temperatures. AGW proponents will of course continue to reassure themselves by nostalgic reminiscence about 1970-2000 warming. They will have to think quickly of some new innovations analogous to short-selling to persuade us of global warming in the face of an intensifying cooling period. OTOH – I’m in Delhi and its in the mid 40s – thats C not F, not much sign of cooling here. I would like to clarify my statement about the effect of growing ice. Hansen claimed that .2 w/m2 of the missing heat from 1993 to 2008 likely went to melting the arctic ice cap. The ice cap has grown at a much faster rate than the decline from 1993 to 2008, thefore based on Hansen’s analysis at least .2/W/M2 must have been released by the growing ice. Therefore if the radiative imbalance since 2008 is calculated to be say be .1 w/m2 from a gain in ocean heat content, it must be corrected by .2W/M2 to an actual .-1W/M2 or a cooling planet. Really, the cool PDO has resumed? I always thought that a positive PDO Index meant that it was the warm phase! The ARGO buoy situation puzzles me. Realizing that they measure something different than the SST. It was once explained to me once that the sea is the ultimate measure of global warming and these 3300 buoys would prove once and for all that Manmade Global warming is real. First it seems that NOAA hid the data. Then it seems that NOAA needed to adjust the data since it does not match earlier measurement methods. Now it seems as though the data is being ignored. Is this no longer considered important? Can someone explain what is going on here and why isn’t the data reported more frequently? Or is there some site where I can get the data monthly. What’s the correlation between global sst and global air temperature? This is key IMHO. Everything else is secondary (feedbacks, adjustments, perception, hysteria, indifference). Here is NOAA’s PDO forecast, which shows it entering negative territory during the April-May-June seasonal timeframe. The first Argo floats were deployed in late 1999. The Argo array did not reach its full planned coverage of at least 3000 floats until late 2006. Not all the floats are equal – about 66% dive to at least 1500 meters, and 46% to 2000 meters. The new Argo data looking at the upper 2000m gives a possible explanation for the wide swings in 700m data – heat is being moved vertically, in upwellings and downwellings, that hadn’t been seen before in the instrument data. Note that the upper 200m of the oceans continued to warm while the upper 700m cooled slightly. Offhand, I don’t know of any papers analyzing Argo data for the full 2000m in 2009. Also note that Argo floats cannot go under the sea ice, or operate over the steep continental slope, nor can the array adequately measure the oceans’ narrow and swift western boundary currents. Here autonomous gliders integrated with Argo will help to link the deep ocean to the boundary currents and continental shelves. The Argo data system can handle this data from gliders. Note that there is already less sea ice than in summer 2007. All I can say is what in the world are you talking about??? Although the maps of Arctic sea ice extent are 2D, the actual sea ice itself is 3D, and the heat required to melt it depends on the volume of ice melted, not the “extent”. Looks like colder water to me! Global warming is due to a radiative imbalance where the earth absorbs more heat than leaves to space. The imbalance results in a heat buildup in the atmosphere and the ocean. Heat is measured in joules. Because the oceans can hold a much higher quantity of joules per volume than the atmosphere it has been agreed by climate scientists that 80% of all the heat accumulation due to global warming must be found in the oceans. The Argo buoys measure down to 2000 meters. Sea Surface temps may be quite different than the temperature of the water at depth therefore the temperature distribution at depth needs to be determined to calculate the ocean heat content in joules. I think everybody agrees that Argo has the answer. So far there has been little heat accumulation from 2002 when Argo started untill 2008. Since 2008 there has been an increase in SST. Whether this is reflected in the Argo data we do not yet know. I suspect that it will demonstrate a heat increase but at a rate that reflects a much smaller radiative imbalance than the models have predicted. Now SST as Dr Spencer points out is about to decline rapidly. I think a few more years and thanks to Argo we will have a real estimate of the real radiative imbalance, positive or negative. You can download the program and subsequently the data every month. You can also get a CD sent to you with the program and the latest data. Contact Megan. According to the study, 15 years of ocean warming indicates”a strong climate change signal”. How does this fit in with Phil Jones statement that there has been no statistically significant global warming for 15 years? Have we now changed weather to climate from 30 years to 15 years? Well I am sure scientists and experts across the world are hanging on every word of that “prognostication”. I doubt we will “see” this either, but you know what I would really like to see? A live panel with you, and then Roy Spencer, Lindzen, Bastardi, Tisdale, Maue and other actual scientists and physicists. It might be rather amusing to watch somebody who incessantly, and surprisingly “confidently”…talks out of his arse on this site, with material that is continually over his head and out of his league…get eaten up by the lions. And if that still is unsuccessful in preventing your “25% skeptical” side from being “nudged down the road” toward the religion you SO want to “believe” in…then I guess you were predestined to go that way anyway. Hint for ya: Listen and try to learn more. You might surprise yourself. Using this second focus, I look for a blue, backwards letter “C” of cold water in anomaly maps of the Pacific, stretching from the Aleutians east and down the coast of California and then westwards beneath Hawaii towards Japan. will resemble the “cold” phase. The second major focus of my thinking revolves around whether swings in the PDO are regular, like a pendulum, or whether they are erratic. It seems to me the PDO attempts to be well behaved, going “tick” for thirty years and then “tock” for thirty years, in the manner of a nice, neat pendulum. However it also seems Mother Nature likes to throw wrenches into the clockwork. Or perhaps the outside influences are not wrenches but mice, leaping onto the pendulum and swinging like Tarzan, and scampering up and down the pendulum in a manner that throws the nice neat tick-tocking and action-reaction-ing all out of whack. One current mouse is the quiet sun. Afraid not. Where there are data to be tortured and idiots to listen the AGW movement will continue. There is tOOOOOO much money involved. You say that the ocean warming from 1993 to 2008 is just what the AGW models predicted. Fine. It is also what we expected from natural climate variation. I recall Bill Gray saying (around 1993) that the Atlantic hurricane activity would soon pick up and that global cooling would commence in the early part of the 21st Century, all due to natural ocean cycles. Of course, he was exactly right about the hurricanes and the lack of warming over the last 12 years appears to support Gray and the natural cycles much better than the AGW model. And lets not forget the lack of a mid-tropospheric tropical hot spot, a gradual drying of the upper tropospheric atmosphere, a major rebound in Arctic ice, the lack of warming in Antarctica, no evidence of a persistent, positive water vapor feedback and all the other areas that the models have failed. Of course, if we go back before 1978, the models have an even bigger problem. They can’t explain any of the climate changes of the 20th century, the LIA, MWP, Dark Ages Cold Period or the RWP. Simply put, the models seem to work for about 20 to 30 years in the late 20th century, but fail miserably for all other time periods. Not a good track record. On the other hand, natural climate variability does a good job explaining the last 120 years and is rapidly deciphering that last 2,000. With a natural climate theory, we do not need to pretend that well documented climate changes didn’t happen. So why are you only 25% skeptical of a theory that only explains 1-2% of the last 2,000 years? Shouldn’t you be 98-99% skeptical based on the observations alone? Well Arctic sea ice is taking a nosedive as R Gates said. “Could we break another record this year? I think it’s quite possible,” said Mark Serreze of the National Snow and Ice Data Center in Boulder, Colo.
We can’t go back apparently according to an “expert” as ice never comes back once it has melted, apparently. Monitoring of Arctic sea ice only began in 1972. I know, lets play a game. Are you up for it R Gates??? Lets imagine you have Roald Amundesen and the crew of the St. Roch standing in front of you. Now explain how the current melting is unprecedented. So still no increase for the period with the most reliable data. The claim that the multi-decadal rise is due to greenhouse gases is a postulation. Here is an alternate explanation: In Little Ice Age the oceans were cool, then at the end of the LIA the Earth starts warming (for some reason) as the oceans warm the solubility of CO2 in the oceans reduces (cf. Henry’s Law) and CO2 out-gasses from the oceans. So the warming leads to a steady rise in atmospheric CO2 that has continued to this day as the oceans have been warming. This matches with the observed geological pattern of the Earth warming then, some years later, atmospheric CO2 increasing. The apparent correlation of CO2 with atmospheric temperatures is therefore not a causal relationship but atmospheric CO2 concentrations are a lagging indicator of ocean temperatures. The timescales and lag of atmospheric CO2 increases starting after the LIA also matches the ‘start of the industrial period’ that is used in the AGW hypothesis as the reason for the rise in atmospheric CO2 concentration. The AGW hyppthesis cannot therefore be sustained. Dr. Spenser is going to be shown to be correct. Larger fluctuations in melting sea ice will produce more cold to the ocean currents. The massive high pressure systems that have been stable for months now over the regions have increased the expansions of sea ice yet will have increased the melt as well. Surface air temperatures have declined allowing greater fluctuations and greater masses to form. I am not a big fan of satelite temperature data if it cannot differentiate the surface temperatures from the atmospheric temperatures. The new meme is the heat bypasses the 700m layer undetected and stealthily reveals itself below? So the “physics as we understand it” is wrong, and the upper 700m of ocean does not contain ~85% of the heat storage of the planet? The science community has been lying to us? R Gates and Anu, would you mind explaining how ocean heat suddenly decided in 2003 to stop increasing in the upper 700m and hide away for another day, completely undetected? Contrary to your claim R Gates, this is not in agreement with climate models. If that is true, then the equatorial OHC in the upper 300m somehow miraculously disappeared as well, again completely undetected through the upper 700m. I think Richcar’s 10:15pm post hit the nail on the head. Look to Argo data to explain much of our current medium term weather fluccuations. I wouldn’t be surprised to a net loss (in joules) to our world’s oceans the next 18 months. The map for the 5 days ending 10 May shows a large volume of cooler than normal water below the surface of the tropical Pacific, with anomalies more than 3°C cooler than normal for this time of the year. Two weeks ago there were no areas with anomalies of below −2°C. “There is still a good deal of uncertainty in observational estimates of ocean heat content during the 1990s and into the early part of the 2000s. This is because of known biases in the XBT data set, which are the dominant source of ocean temperature data up until 2003 or 2004. Numerous authors have attempted to correct these biases, but substantial difference remain in the “corrected” data. As a result, the period from 1993 to 2003 still has uncertainties that are probably larger than the natural or anthropogenic signals in ocean heat content that happen over a period of 1 to 3 years. However, the decadal trend of 10 to 15 years seems to be large enough to see despite the uncertainties. Because Argo begins to become the dominant source of temperature data in about 2004, the period from 2000 to 2005 is especially worriesome because of the transition from an XBT-dominated estimate of ocean heat content. Is Josh Willis mistaken when he infers XBT was still contaminating the ARGO data through 2004? How is it then any conclusion can be made that OHC has transcended (does heat rise?) to below 700m when the data used is riddled with so much uncertainty prior to 2004? What we do know is this year OHC is going to drop significantly as evidenced by recent data from the equatorial upper 300m. Would should also take note from 2008 to 2009, global OHC dropped. It is going to drop again in 2010. I’d still like to know if heat is accumulating below 700m, how is it going undetected. R Gates and Anu, please explain this phenomenon as it appears to be counterintuitive. In Bob’s defense, the rapidity of this change is catching most everybody by surprise, I think, even those who thought we’d have La Nina before year end. Looks like it is coming much sooner. I took the coward’s bet in that thread, and said that while I wouldn’t (at the time) bet on La Nina before year end, I wouldn’t bet against it, either. So according to your latest post (below) it hasn’t resumed yet but the computer model says that it’s got a ~50% chance of going negative in a couple of months? The 20-30 years duration where does that come from? Richcar, can you please prove that the ice cap has grown at a record rate since 2008? (and faster than the decline from 1993-2008)? What months are you basing this analysis on? Here is the ERSST PDO Index just sent to me by meteoroligist Joe D’Aleo. It shows the PDO re-entering in its negative phase in March and April as the last El Nino continued to dissipate. Oops. That should have been “meteorologist.” Typing too quickly. the Northwest Passage whereas in 2007 a sailboat did it in a several weeks. What major rebound of Arctic ice are you talking about? I haven’t seen any evidence of a rebound. And Antarctic is still warming. Where are you getting your facts from? Joe you have it backwards, A low pressure over the Arctic Basin is what favors ice divergence, not a high pressure. Amundsen took 3 years to sail west through the Northwest Passage (1903-1906). The St. Roch took 2 years to sail east through the Northwest Passage (1940-1942). Amundsen was trapped in ice each of three winters. He came and went from his ship, and learned Arctic survival skills from the local Netsilik people that would later prove useful. For example, he learned to use sled dogs and to wear animal skins in lieu of heavy, woolen parkas. Due to water as shallow as 3 ft (0.91 m), a larger ship could never have used the route Amundsen travelled. This says more about 7 guys with enough money and supplies to wait for years until the shifting ices of the Canadian coast allow them to slip through, than the Arctic being “ice free” 104 years ago. There seems to be only a few bottlenecks among the Canadian islands where a ship would have to sail among ice floes. This is probably unprecedented in historical times. The quiet sun is suppressing energy loss to space thereby creating a nore negative polar oscillation pressing all the air circulation systems equatorward. That leads to a SOI lower than would normally be expected for an El Nino of the moderate size just experienced. That El Nino has been restrained from pushing the ITCZ and the mid latitude jets jets poleward as much as a similarly sized El Nino would have done whilst the sun was more active. The energy from that El Nino is being held nearer the equator and that could lead to the more active hurricane season some expect. However we have not seen such a global air circulation system since before satellites. The whole satellite era to date has been dominated by a positive polar oscillation so we cannot be sure that the current setup will necessarily translate into more hurricanes. Meanwhile the three main cloud banks of the ITCZ and the two mid latitude jet streams are nearer the equator than before 2000 (because of the more negative polar oscillations). The result is that global albedo is higher and less energy is entering the oceans to replace that lost during the recent El Nino. So as long as the sun stays quiet the position of the cloud banks will keep the solar input to the oceans lower than is required to replace energy released by the oceans. The quiet sun might slow down energy loss to space but it also reduces energy input to the oceans by moving those cloud banks equatorward. Where are YOU getting YOUR facts from??? You say that the ocean warming from 1993 to 2008 is just what the AGW models predicted. Fine. It is also what we expected from natural climate variation…. R.Gates is NOT 25% skeptical, even though (s)he says he is. That is just a useful argument device. The true objective is to place doubt in peoples minds and recruit them to the AGW cause. Here is R.Gates without his sheep’s-clothing, on his favorite subject arctic ice. 1) Reflects sunlight, keeping the earth’s albedo in a constant range. When the ice cap melts completely, you can be certain that RAPID global warming is immenent. An ice free arctic will mean massive warming from the loss of temperature control (like breaking the thermistat in your home), as well as the POSITIVE FEEDBACK of releasing massive amounts of methane from the arctic region. All this is assured, and already too late to stop.. .and still the fools are arguing about who will get all their precious oil reserves from the arctic…as though it will be business as usual in the future…such a foolish, blind, narrowminded, and selfish species. Gaia will be bringing on the culling soon. Soon people will be heard speaking out often in many places for something, for anything at all that does not have to do with the unbridled and soon to become unsustainable growth of the global political economy. The silence regarding the threat of rampant economic globalization is deafening. How much longer will it continue? No I do not think our R Gates has a skeptical bone in his body. The recovery began in 2008 after the 2007 fall minimum. We do not know how much volume was added. The new ice sat satellite should help. Heat released from the growing ice should have contributed to an increased in ocean heat content from 2007 onwards. O dear – what happened to the “increasingly active sun with its irradiance steadily increasing”? Spotless again today. Still no “signs” that 2010 will cool down? I’m willing to bet that 2010 is likely to be one of the warmest years recorded, if not the warmest. That’s hardly agreeing with your prediction of UAH temperatures. And I think the composition of the atmosphere would certainly play an important part in that warming. I’ll take you up on that bet. Based on UAH temperatures. 2010 will not be as warm as 1998. I think Tom would be better advised to take his chances on the stock exchange than putting any actual money behind warming predictions just now. We are heading rapidly into La Nina conditions. The Pacific subsurface cool anomalies are a little ahead of the normal schedule but only a month or so. The La Nina peak could be in late October to November. There is a definite pattern in how the equatorial Pacific subsurface anomalies oscillate between El Nino and La Nina. Yesterday’s cross-section is showing -5C and -6C in some areas. There is enough cool anomalies at 130E to 150E (at the beginning of the circulation pattern) to sustain a La Nina until early 2011. Compare yesterday to the same time last year when an El Nino was building. … with the same map at the 2009-10 El Nino peak. This is what the map looks like 8 months before an El Nino peak. This is what the map looks like 8 months before a La Nina peak. I thought we were talking about the Earth here? To what planet does this refer? Sorry, links didn’t work. Here is the main page they came from. This NSDIC site shows the increase in arctic sea ice from 2008 to 2009 as 25% or 1.08 million sq km. That should have released a lot of heat due to the laws of heat of fusion. The largest decline was for the year 2008 at -23 %. The long term decline from 1978 is about -10%. However many of us think based on declining arctic ocean SST’s we will likely have thirty more years of adding sea ice. The satellite data began in 1978 when the Arctic Ocean SST was at a thirty year low. I agree that water movement from the Atlantic is a key determinant of Arctic ice. Ocean currents around the Arctic can indeed be expected to have equal or greater effect on ice extent than air temps – this point is made repeatedly on this site when debates on Arctic ice get confined to air temperature and winds only. Look at the first graph with black (Barents temps 100-150m) and red (AMO) lines. Strong correlation between Barents subsurface temps and the AMO. Cyclical warming of Barents water with up to 4C magnitude can only be from ocean currents (tail end of the north Atlantic drift) not air weather. Forcasting the sinewave forward its not hard to predict that as AMO now heads south, so will Barents water temps, reflecting reduced warm input from the Atlantic. And thus the Arctic ice recovery will continue. O dear – what happened to the “increasingly active sun with its irradiance steadily increasing”? So, the new science paradigm, and at the same time the “Verbum Dismissum” (The forgotten word) is Eλεκτρον. I never predicted that there would not be a La Nina or that there would be one. My last post on La Nina events illustrated that they rarely happen after an El Nino Modoki. Also, it’s not a La Nina…yet. Bingo. It’s what I was seeing in the NINO3.4 SST anomalies in the post that Jeff linked. But it’s a two-edged sword. A La Nina helps to fuel the next El Nino. sort of off topic but Help! I just found this page and wonder if it may also have something to relate to sea temps and oddities lately? It claims the sea floor of Aus is rising 13 feet a day. buoys said to be faulty, but more than one was giving the same read. and I couldnt find CSIRO temp anomaly the site mentioned..
My wife never said she was “25% pregnant”. It looks like it follows the 80 years +-Wolf-Gleissberg cycle. R. Gates wrote: “And I’m wondering why the AGW skeptical group is not talking about this major study on the overall warming trend of the oceans (not the cyclical rise and fall of temps based on the cycle of El Nino/La Nina),” and you linked Lyman et al (2010). The XBT data is separate from the Argo data – it does not “contaminate” it. There is a similar situation when stitching together the data from satellites that give temperature data for the troposphere, for instance – each satellite has slightly different instruments, orbits, calibration, and often trying to stitch the datasets together uncovers some subtle problem that wasn’t realized before. The multiple-satellite raw data used by Dr. Spencer at UAH, for instance, was incorrectly reduced for about 27 years (RSS found significant errors in 2005). Luckily, once a problem is uncovered, researchers can go back and redo the data processing correctly. How is it then any conclusion can be made that OHC has transcended (does heat rise?) to below 700m when the data used is riddled with so much uncertainty prior to 2004? Do you mean ‘descended’ ? As I said above, the first Argo floats were deployed in late 1999, and the Argo array did not reach its full planned coverage of at least 3000 floats until late 2006. Not all the floats are equal – about 66% dive to at least 1500 meters, and 46% to 2000 meters. Before 2004 the array was not fully deployed. And not all the floats give the full 2000m data. Ocean heat changes below 700m are directly measured, by about half of the Argo floats. Since there are 3255 floats as of 21-May-2010, that is more than half of the planned 3000 float array. The main point of the 2000m ocean heat content rising (2003-2009), while the 700m data shows a pause to warming or a slight cooling, is that vertical currents are significant in moving ocean heat – upwellings and downwellings. What we do know is this year OHC is going to drop significantly as evidenced by recent data from the equatorial upper 300m. No, I don’t know that. OHC is for the entire world’s oceans, down to 2000m. A transition from El Nino to La Nina in a single year is not guaranteed to cool the entire world’s oceans. What happens this year will be clear in 2011. Would should also take note from 2008 to 2009, global OHC dropped. It is going to drop again in 2010. I’d still like to know if heat is accumulating below 700m, how is it going undetected. It is detected by half of the Argo floats. See above. Ocean currents form closed loops in three dimensions – heated surface water downwells, heated deep water eventually upwells. To start the loop again. What happens when the cold water from the oceans depths starts the surface portion of its loop 0.1°C warmer than the last time this water was on the surface ? The SST has gone up. There are plenty of different loops, of different periods and locations. The topography of the vast oceans is complicated, and the oceans are on a spinning planet. Be careful not to get your knuckles rapped by the sun high priest Svalgaard for suggesting that minute and insignificant TSI changes can affect climate. Check the hymn sheet you are singing from. According to solarcycle24, solar flux is on a downer, sunspots flat out at zero, but planetary A index is showing a small rise (but it was much higher 3 weeks ago). Of course there will be a 2013 peak no-one argues with that, just its looking a very weak and sputtering rise. Its amusing that AGWers are looking to the sun for solace, when pre-2004 there was a universal chorus of AGW ridicule and abuse at any proponents of a role for the sun in climate. R.Gates is NOT 25% skeptical, even though (s)he says he is. Gail, I agree 100%. If R. Gates is 25% skeptical, I sure don’t want to meet a 0% skeptic. Roger Pielke is commenting on the Nature paper. He points out that 40 % of the OHCA for the 1993-2008 period was found from 2002-2003 where to many of us there appears to be a suspicious jump in OHC where the XBT data merges with the ARGO data. Roger asks why Ocean Heat accumulation due to AGW should occur in such bursts. He also points to the lack of warming since 2004. Wow, I used to have a grudging respect for R. Gates, supercilious but at least civilized, but this is quite revealing. Anyone spouting ‘Gaia’ nonsense and such anti-human ‘culling’ language loses all credibility in my book to their claims of being some sort of ‘rational inquirer’. Gail, thanks for posting, that was a public service. The big question is if the sun is headed into a grand solar minimum. I believe this may be the most ‘pessimistic’ of the sites and have seen them make a ‘correction’ or two that seemed to increase the downward slope of the trend, but, none-the-less, I still look at cryosphere. Anyway, it is pretty obvious that 2007 was a record low year. Since then, the minimums each year have been significantly higher. The maximums each year have been steadily increasing and reached the 30 year ‘normal’ level this spring. That’s a rebound, no matter how you slice it. Will it continue? I believe it will, but that is irrelevant to my statement. As far the Antarctic, I am well aware that the Antarctic Peninsula has warmed considerably and that some papers have used statistical methods that spread that highly localized warming to half the continent. I discount these studies. Other studies that aren’t entirely agenda driven, have indicated that about 95% of the continent has been either steady or cooling for the last 60 years. Certainly, the warming of the Arctic Peninsula can not be explained by AGW. It is an extremely local effect that is very likely the result of an ocean influence. Incorrect. I am only 75% convinced in the validity of the theory of AGW and therefore, 25% skeptical. Furthermore, I’ve stated many times on WUWT that the next few years a critical in deciding which way that percentage will be leaning, specifically if we do not see a new summer low in the Arctic sea ice extent (the September low going below the 2007 level) by 2015 and a we also see a recovery in sea ice volume in the Arctic, I’ll likely lower my level of conviction in AGW. A “true believer” or someone who is 100% convinced in their views will not lower their level of conviction regardless of the facts presented to them– as seems to be the case with the faithful true believers on both sides of this issue. I come to WUWT to learn about alternative viewpoints…weeding through all the political nonsense to get to the real science. Downwelling significant to THC only occurs at locations such as the Norwegian sea and one or two other locations such as the Southern Ocean south of Australia & New Zealand. You need near freezing temperatures and increased salinity from ice formation for significant downwelling of the type that drives THC. You cant push warm water down into cold, no matter how much political support you have. That is why ocean currents above and below the 3.5 degree isentrope are separate. Amusing how AGWers are all of a sudden fancying themselves as oceanographers and concocting this wild myth of warm water downwelling. Desperate stuff. The new Lyman nature paper shows there are only about 14 different ways to correct the errors in the XBT data so we should just start using the Argo floats data only (which show no heat accumulation since 2004). Thanks for the ‘heads-up’ on R. Gates. These are the kind of people who are driving the AGW crisis myth. (It is somewhat ironic that they portray themselves as ‘voiceless’ when all their wacky claims regularly appear on the front page and they have almost managed to financially hamstring the entire Western Hemisphere with carbon mitigation nonsense.) These are also the type of people that I want to talk to the most. Their arguments are so easily refuted, that the more we (respectively) engage them, the more everyone else can see that there is no AGW crisis. Fair enough. But why do you need to wait for the next few years when there are no observations in the last 2,000 years (or 2 million, or 2 billion) that support the theory, except perhaps for the last 20 or 30 years? And even then, the observed warming does not fit the pattern prescribed by the AGW Theory, despite 20 years and billions of dollars of research money spent on trying to find the AGW fingerprints. It just doesn’t seem to make sense to have so much faith in a theory that has so little success at explaining observations. Cryosphere Today is the source I have been looking at the longest. I believe this may be the most ‘pessimistic’ of the sites and have seen them make a ‘correction’ or two that seemed to increase the downward slope of the trend, but, none-the-less, I still look at cryosphere. Anyway, it is pretty obvious that 2007 was a record low year. Since then, the minimums each year have been significantly higher. 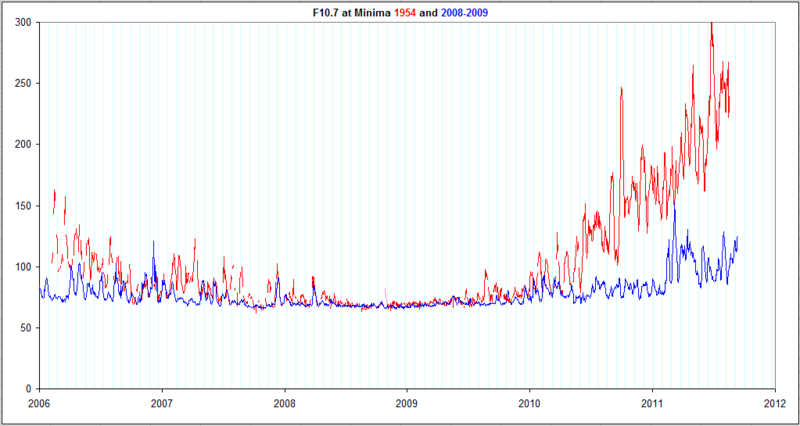 The minima in 2007 and 2008 are a deadheat, 2009 shows an increase. The maximums each year have been steadily increasing and reached the 30 year ‘normal’ level this spring. That’s a rebound, no matter how you slice it. No the maximum in spring 2008 was the largest since 2003 but the maxima have decreased steadily since then. The 30 year ‘normal’ maximum is 14.136 Mm^2, this year it was 13.812 Mm^2. That’s not a rebound! Will it continue? I believe it will, but that is irrelevant to my statement. No real evidence of that in their data, looks like a small scale fluctuation around the 30yr mean, the current cycle looks just like 1994/5. A few more years of recovery at the North Pole and a continuation of the trend at the South Pole and we will likely be setting record high sea ice extent, approaching a tipping point where the Earth’s dramatically increasing albedo will topple us into the next ice age by 2100. Yet the global ice plot at that same site shows the latest maximum to be the record lowest in the 30yr span, and the latest minimum to be the 4th lowest. I didn’t say it sinks in place – there are existing vertical currents, and they are heating up as the ocean surface absorbs the radiative imabalance, decade after decade. This heat doesn’t get there by diffusion – it’s the existing vertical ocean currents, heated up by a fraction of a ° C, which translates into massive amounts of heat. Yup, only at certain, existing vertical current locations. And these vertical currents are warming, as is the ocean. Amusing how GWMers are all of a sudden fancying themselves as scientists and concocting this wild myth of oceans not warming. Desperate stuff. If the Arctic ice has “rebounded”, why is it melting at a record rate this spring ? 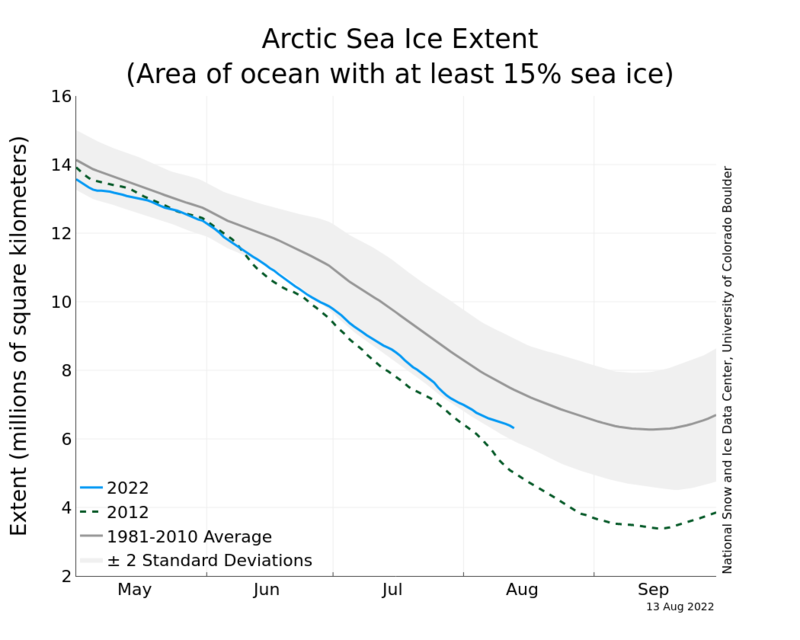 Are you going to ignore the ice thinning until the Arctic is ice free one summer ? The “record” goes a lot farther back than 30 years. Warmth is better. Cold kills. And the climate is completely normal. Argo is supposed to provide a temporal three D map of heat in the ocean to 2000 meters. If there is significant downwelling it should map it. I have seen references to the absence of the postulated Atlantic conveyor belt. It seems there are many missing parts along with the heat. Has anybody provided a time varient display of the Argo data similiar to the TLT displays of the atmosphere fromm RSS? Amuse yourself with this chart from today’s official ARGO site. For me the reason why I do not believe in AGW is really quite simple.I took it for granted it was true as MSM stated science has proven it. But as I began to pay closer attention it confused me why I would here one day that glaciers in the Himalayns would melt by 2035 then hear no it will be 2300 and the report wasnt from science but from enviromental activists through WWF. I decided to turn to the internet and just learn the facts for myself,not even knowing that it was co2 that was to blame for man made global warming. I quickly found out the only places I could get scientific facts to satisfy my thirst for understanding were sites that were deemed “unscientific” by groups that had no science, only alarmism unsupported by facts. Just the fact that the medieval warming period has been basically obilterated made me ask questions.The more I looked for answers the more disturbing it became for me. Why is it that the supposed denialists all have the same science and understanding that I now embrace and the warmist or alarmist sides are all over the map? One site says one thing, one site says another. I think the answer is easy. It is not difficult to have the science stay consistant as truth does not require making up stuff along the way,it just is therefore consistent. I could go on and on but just for a lark listen to the congressman on you tube who is in charge of the dep’t of global warming. His name is Edward J Markey (d) and he compares proving AGW to baseball players taking steroids. The only scientific fact he even utters is a ridiculous prediction of sea levels rising 6 feet. Not even the suspect IPCC supports that wild statement and yet this man holds a chair of this importance? Truly scary, just my opinion. Smokey, what are you trying to say with the link to an SST El-Nino temperature anomaly map? El Ninos come and go and affect the SSTs. I don’t see how that is relevant to Anu’s discussion. There is one crucial difference: those skeptical of the CAGW conjecture are not trying to get their hands into the pockets of everyone like the climate alarmists are. Jim, can you please explain how the last 20-30 years of Arctic changes does not support AGW Theory? I think the Arctic explains it quite well. For many years before you started seeing record ice losses in the Arctic the models had predicted it would decline. Same with melting in Greenland, melting of other Arctic glaciers, tree-line moving further north, amplified autumn temperatures, permafrost thawing, etc. etc. These were predicted long before they were observed in reality. The thing with the Arctic is that if it was just one variable responding, say air temperature and nothing else, then you could make a case that AGW theory isn’t working. But the model-predicted changes are happening in ALL the climate state variables in the Arctic. And you don’t get those changes in the climate models if you run them with pre-industrial concentrations of GHGs. You can download climate model output and look for yourself at the differences in variables such as sea ice extent between model runs with and without the observed record of GHGs not included (and this is the observed record, not some future estimation of GHG levels). Basically the ice stays mostly the same (ignoring some natural up and down climate fluctuations). You only get the steep decline of sea ice in the models when you include the observed GHG record. So then the question becomes, why is this so? Did the climate modelers tune the models so that when they put in the observed GHG record so that they would match up with the observed record of sea ice decline? Perhaps, but then you would think the model wouldn’t do a good job predicting other observed changes. I’m not a modeler so I don’t know all the tunings done to the models, and I don’t fully know all of the Earth’s variables the models have been able to accurately predict and which ones they haven’t. Perhaps someone on here is a climate model expert and can comment. Jim, the Cryosphere today does not show the Arctic ice rebounding and I don’t think you have read the Antarctic warming studies and the factors responsible for those warming trends or you wouldn’t say that Antarctica hasn’t shown signs of warming. Remember, satellite data does cover the Antarctic ice sheet so surface temperature can be measured over the entire ice sheet (from 1981 onwards from AVHRR and there are also earlier sensors from TIROS). I think it’s important to be clear also about the different sea ice trends between both hemispheres. In the Arctic you have statistically significant negative trends in all months and all regions. Only the Bering Sea in winter has shown some recent positive trends, but of course this still melts out every summer. In Antarctica you have negative sea ice trends in the Bellinghausen/Admundsen Sea that are statistically significant and you have statistically significant increasing trends in Ross Sea sea ice, both in winter. Really only the winter trends matter in Antarctica since it’s mostly a seasonal ice cover anyway and there is large interannual summer variability. The factors contributing to the negative trends near the Peninsula and the positive trends in the Ross Sea have both been explained by ozone losses and warming. The depletion of ozone maintains the cooling within the polar vortex, which increases the winds around the polar vortex (and this propagates downwards, strengthening surface winds). This in turn pushes the ice away from the coasts in the Ross Sea, increasing the sea ice extent. The Antarctic Peninsula adjacent to the Bellingshausen/Amundsen seas is an area of marked warming and the sea ice appears to be responding to that. Wow, Smokey what an accusation. I didn’t realize that I’m only after your money. I thought I did the work I do because I love this planet. I sure wish I knew how it could make me rich too. Doing something you love and making money doing it would be a wonderful thing. Seems like it depends on where you look. “Loehle, Craig. 2009. 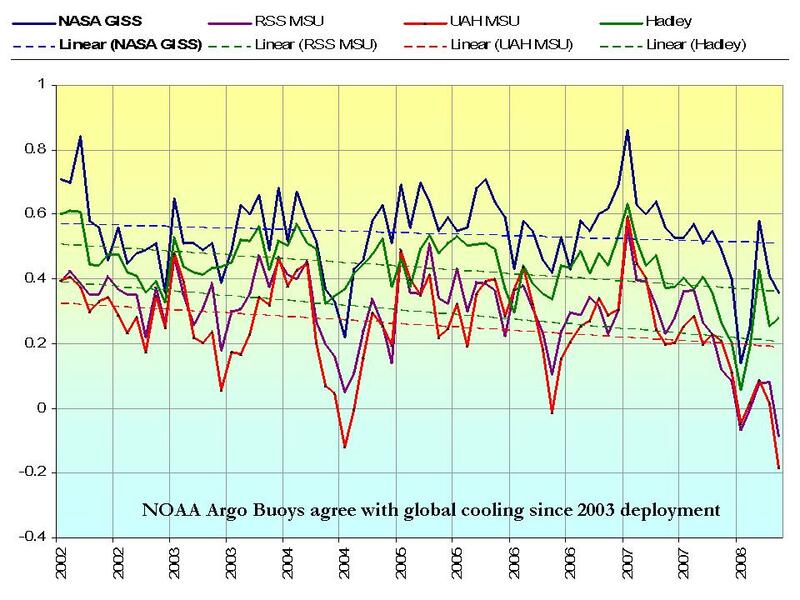 Cooling of the global ocean since 2003. Energy & Environment 20(1&2): 99-102. What I am seeing is a sixty year oscillation and we are now at the top plateau about to head back down to cooler temperatures, where La Nina will dominate. Sorry, clicked on the wrong one. Here’s SST and heat content. Natural climate variability is the starting point. The problem is that alarmists start with the notion that CO2 is the null hypothesis. It isn’t. That is a red herring. The fixation on the belief that CO2 drives the climate results in wrong conclusions. How could it not? And AGW is a hypothesis; CAGW is a conjecture. To accurately discuss the issues requires using the correct terms. For example, a theory provides a means to make accurate predictions; a conjecture, being simply someone’s opinion, does not. You AGWers will never give up. We could be in the middle of another “Little Ice Age,” and you’d still be trotting out your manipulated GIGO models and claiming mankind is on the brink of a CO2-induced climate meltdown. “The Arctic Ocean is warming up, icebergs are growing scarcer and in some places the seals are finding the water too hot,” according to a Commerce Department report published by the Washington Post. More evidence of human-caused global warming? Hardly. The above report of runaway Arctic warming is from a Washington Post story published Nov. 2, 1922 and bears an uncanny resemblance to the tales of global warming splattered across the front pages of today’s newspapers. It is one of many historical accounts published during the past 140 years describing climate changes and often predicting catastrophic cooling or warming. Who pays the piper calls the tune. Sorry it’s so hot in that kitchen, and you may sincerely be doing good work at whatever you do. But the government is joined hip and thigh with those intent on passing Cap & Trade, with very flimsy science supporting any of it. But you’ve got yours, right? So you’re OK. The problem is, organizations like GISS and a lot of others want mine, too. Every time they make another scary announcement, I can feel their hands in my pockets. The fact carbon trading is going to bankrupt countries and leave millions unemployed means nothing to the greedy who are behind this fraud. Check out Maurice Strong before you join the rest of Strong’s “useful idiots” under the bus five years from now. Once the US Cap and trade bill is passed and the other WESTERN countries sign on, “capital” will head to China and India in a flash to take advantage of loose environmental laws. This means all the western climate scientists will now longer be needed and will find themselves without a job. The really sad part is the environment will suffer dreadfully from unregulated pollution abroad and there will be no real reduction in CO2. This cold that is setting up will be lasting much longer and be more intense. So far no one has mentioned anything of the salinity changes as well. consistent with rises in GHGs. There have been moments of natural variability, such as the extremely positive AO of the late 1980s/early 1990s that contributed to a reduction of old ice in the Arctic Basin, but that stopped and the ice is still declining. There have been pulses of warm water seen entering the Arctic, but it’s episodic and the ice is still declining. It seems that no matter what the weather patterns are doing, the ice is still declining. So why is that? What is acting on the system to cause this decline? It seems you constantly say “it’s natural variability” but you don’t seem to know what that means. We get why we have glacial and interglacial periods that gave rise to past extreme temperature and ice fluctuations, that’s not what is pushing on the system today. So please…point to the natural variability that is causing it. Smokey, scientists have been looking for a natural variability signal for years in trying to explain things like the decline in the Arctic sea ice cover. How much better would it be for everyone if it is natural variability. Then we can hope that it will recover and the Earth won’t experience a dramatic shift in its climate like it would if the Arctic Ocean were to become open water (remember atmospheric and oceanic circulation is driven by the temperature difference between the equator and the poles). There are many papers with links to natural variability, and I see in these papers that scientists are constantly struggling to find links to circulation patterns to explain the ice loss every year. But it doesn’t seem to be working. Weather patterns that scientists once believed would result in ice gain now also lead to ice loss (the negative AO this winter is a perfect example of this). Cyclonic or anticyclonic flow in the Arctic Basin seem to both give low summer ice conditions where before Cyclonic usually meant more ice. So ok if it’s the oceans causing the rapid melt, then why is the Arctic Ocean warming up so much? Is this the missing heat? And if so, isn’t that a bad thing since it would also lead to no summer sea ice which again is a big climate shift. Honestly I hope I’m completely wrong and the ice rebounds in the next few years. That would be great for us all. Kirk, you get that icebergs come from land and not the ocean right? And moraines and earth and stone are on land and not the ocean. BTW..your link didn’t work. Skye, I can recommend Spencer’s latest book. I have worked with computers, modelling and control loops for many years. Spencer is onto something when he describes how he believes climate scientists mis-interpreted the feedback-loop, and how they consequently modelled the climate wrong. He also has a very plausible theory on why. He has a peer reviewed paper on it, but it was total silence from the media. Again, it’s highly recommended. You will enjoy reading it. In terms of the sea ice area, we should be using the Global Sea Ice Area which shows a consistent downward trend of about 0.16% per year. There is no rationale for CO2 to be causing an increase in the Antarctic sea ice area – maybe ozone depletion but that would take us to a completely different explanation for the climate and the slight warming of the planet. Thanks, I hadn’t seen that thread before. No doubt there were existing ocean currents and multi-decadal oscillations, but I was wondering if the heat was increasing, especially since 2000, when the Arctic summer sea ice had much faster summer melts. It wouldn’t explain the rising global surface temps, or the world ocean’s heating, but it could be a significant warming signal superimposed on an underlying warming trend. Time will tell – the next 10 years, say. If the Arctic ice truly does recover (summer minimum extent, total volume) in the next decade, I will give a lot more attention to the AO/PDO/NAO arguments. Since the late 1970s sea ice extent has decreased substantially [Comiso et al., 2008], whereas, simultaneously, AW [Atlantic Water] has become warmer and perhaps more abundant in the BS [Barents Sea]. The question is, will this warm water flowing into the Arctic from the Atlantic continue to become warmer, will it go back to “normal” because of a 60 year cyclical AO, or is there a sine wave signal (AO) superimposed on a global warming signal (exponential incline) ? I think data from the next decade will be much more persuasive to most people than all the arguments bounced around here. If one is tying the Arctic sea ice extent to the AMO (and there is a pretty good match – inversed of course), then one should be looking at what the AMO is doing right now. And that is spiking higher – the AMO index was 0.478 last month which is nearing the highest levels the AMO gets to. The AMO sometimes spikes in response to large El Ninos (4 to 6 months after the El Nino peaks) and it appears to be doing so this time. The weekly SST updates show it is declining slightly now but if there is a link between the AMO and Arctic sea ice, the ice should have been declining over the past two months, which is exactly what it is doing. sea level rise is a proxy for global warming although it needs to be divided into steric and mass components. The bottom line is the long term since the beginning of the Holocene is the same as it is today. Therefore any radiative forcing due to global warming must be manifested in a sea level rise above what has been happening for ten thousand years. An increase in the rate of sea level rise is not happening. A good synopsis on sea level rise. Finding a natural variability signal would be nice [there must be dozens, if not hundreds that all interact]. But it is not necessary; the Higgs boson hasn’t been found, but no one doubts gravity. And it does not matter to the discussion if, as you say, billions of people will be affected by change. If you’re inclined to make that argument, then consider the confiscation of wealth through Cap & Trade, and the diversion of food into ethanol, with its concomitant increase in food costs, and the allocation of resources by government bureaucrats rather than by the infinitely more efficient free market mechanism, and consider the billion-plus people who now live on one dollar a day or less, who will suffer immensely as a direct result of C&T, with millions starving. Literally. So let’s not go there. I know it’s difficult, but you must at least try to wrap your head around the idea that everything observed is well within the parameters of past climate variability. Everything. The assumption that a minor trace gas is running the climate is based on no measurable evidence. So why try to construct a hypothesis around it? Instead, heed Occam’s Razor: Never increase, beyond what is necessary, the number of entities required to explain anything. I am not saying that CO2 has no effect. Radiative physics shows that it does. The question is: how much. And the answer is: not much at all. In fact, the effect of atmospheric CO2 is too small to empirically measure. That’s why it is only modeled. And even though atmospheric CO2 has very little effect on temperature, probably because other planetary feedbacks naturally counteract it, it must be kept in mind that human produced CO2 amounts to only one molecule of every 34 emitted in total. Disrupting civilization based on the CO2=CAGW conjecture only makes sense to those who will benefit, and that leaves most of us out. Anyone with common sense can see that C&T is simply a tax by another name. 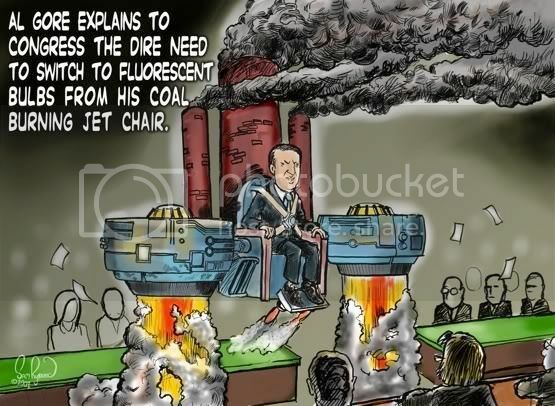 Those carbon credits that industry must purchase in order to be allowed to emit CO2 will be paid for by you and me, in the form of higher prices. Do you think you will get a pay raise to keep up? And if anyone believes the government will forego the added revenue in order to reduce the amount of CO2 emitted is simply dreaming. This Administration and Congress consistently lies to Americans. They have zero intention of actually reducing CO2 to 1990 levels, or reducing it at all. They’re saying anything, then doing what they’re going to do — which is to allow all the CO2 to be emitted that industry wants, in return for the dollars per ton that Cap & Trade generates. It’s all about the money. If they really believed in CO2=CAGW, they would be setting an example for us. Please point me to the peer-reviewed journal article, I would like to read it. I don’t however want to buy the book at this time. I wouldn’t put Joel Shore in the same sentence or classification as Gates and Wren. The former is a real and legit scientist/physicist. The latter are not. Stephen Wilde, as I said before, I hope you keep track of your entries here and produce a book someday. You have an interesting logical flow to your sentences that make it easy and rather magnetic to the reader, to want to follow along. Uh, I don’t think the Heartland Institute was offering up their little revival meeting this past week for free. Money is flowing on both sides of this issue…and billions of dollars are at stake on both sides of the issue. Please cite the “billions of dollars” at stake for skeptics who refute CAGW. Contrast that with what the alarmist contingent is trying to get at… in which case it is $trillions. So, whose $billions are skeptics trying to get? Is it possible to convert the threads that I have contributed to into a format that can be emailed to me ? The Sun is fixing to take off and we’ll be looking at a solar cycle that resembles an elongated solar cycle 21. To prove Hathaway and Svalgaard wrong. Odd cycles are the ones that produce the warmth, not the even ones, but a decent cycle may prevent drastic global cooling. …A climatologist at NASA who was not involved in the research said this week that the long-term trends in ocean warming presented in the new study have confirmed other results in the field. I’m willing to bet that 2010 is likely to be one of the warmest years recorded, if not the warmest. At present the bettors on https://www.intrade.com are collectively estimating that there’s an 80% chance 2010 will be the warmest year on the GISS record. If they’re wrong (and I hold onto all my bets), I’ll take some $700 out of their hide. However, my cool-side bet isn’t based so much on thinking that they’re wrong, just that they’re over-confident. I think the likelihood is about 60%. If the next months’ measurements turn cooler and the odds fall to, say, 60%, I’ll sell my bets and exit with a 100% gain. (Most likely I’ll sell some bets and hold onto others.) The warmists can win too, if they stay the course. It’s a win/win situation. All aboard! Long story short: It hasn’t been the quick, easy planting season it looked like it would be a month ago. And, the progress that has been made has varied widely in the last few weeks. PS: Intrade’s bettors estimate the chance of 2010’s minimum arctic ice extent’s exceeding 2009’s at 43%. That’s another offer I think is a bargain (and have wagered on). Uh, I don’t think the Heartland Institute was offering up their little revival meeting this past week for free. Attendees get their expenses paid and probably a speaker’s fee, but that’s only a once-a-year event. Maybe some of the free market think tanks have occasional dinners where speaker’s fees are also paid, or they pay reprint fees for articles in their journals. But that’s very thin gruel to try to make a living on. REPLY: Mr. Gates, first, I don’t like you putting words in my mouth. I haven’t said “conspiracy”, but YOU DID. I expect an apology if you want to continue to post here. I take this issue seriously, and you can either apologize for connecting me to those words, or you’ll never post here again. I said nothing about a “conspiracy” in the data, only about the way the post measurement adjustments tend to add a positive bias. NOAA confirms this by their own graph for example showing cumulative adjustments on USHCN1. USHCN2 and GHCN3 have increased even over those numbers. It speaks to a flawed method, confirmation bias, and sloppiness in the data processing. It says nothing about conspiracy. When the adjustments add warmth, making press releases about “warmest on record” becomes more likely. Secondly, if you understood in the slightest what you are talking about, you’d know that both HADCRUT and GISS derive a significant portion of their global data from USHCN and GHCN, which ties them to the same data adjustment problems. NOAA makes a processing change, they necessarily follow. It points to the problem of one group’s methodology (NCDC) having influence by the fact that it is the single source for the majority of worldwide surface data. This is why when countries like Russia do their own data examinations of their own country station data, they see differences. I have now access to the same surface station data outside the NOAA adjustment process, done in parallel but with a process that cleans the data using a different set of processes that were developed for business forecasts where failure means loss of revenue. It was developed because business interests stopped trusting the NOAA/NCDC data when they had to bet millions of dollars on the outcome. When that work from that data is published, perhaps even you might see the adjustment problem with NCDC’s methods. I don’t know if anyone else has noticed that there two separate indicies for PDO. One is by NCDC and the other by JIASO. They seem to be different . From 1999 foreward, the NCDC is 20% positve and 80 % negative during the 136 months . JIASO is 46% positive and 54 % negative . Significant difference. During 2010 NCDC shows the index going negative while JIASO is going positive to the end of April. One gets a different impression to what is happening. One index seems to say that PDO has been mostly negative since 1999. The other says , it has been fluctuating and essentially went neagtive after only September 2007 . So it depends on whose PDO index one quotes ? You’re probably right on that, though they were charging a tidy fee for those who just wanted to attend. Regardless, I don’t see the conferences as being a big money maker for Heartland as overall that’s not the point of those particular conferences, and who knows, I may even get out to the next one myself. My more essential point is billions of dollars are riding on both sides of the issue, and with that much money at stake, sometimes the science gets lost. (okay, most of the time the science gets lost). In my own search for the truth of AGW science, the more someone on either side begins to take a political stance (which is at heart an economic one under our current system of government), the less I tend to listen to them. I’d be careful, if Intrade are that confident perhaps they have received some assurances from HADCR, GISS, UAH etc. Its not the reality that will count but the “official” record. I don’t see the conferences as being a big money maker for Heartland as overall that’s not the point of those particular conferences, and who knows, I may even get out to the next one myself. Thanks for the informative response concerning AMO, Barents etc. The next 10 yrs will indeed give important answers. I have this hunch that the AMO involves oscillation in the strength of the north atlantic drift but this could be proved completely wrong by more ocean data from the N Atlantic. I don’t know if anyone else has noticed that there two separate indicies for PDO. One is by NCDC and the other by JIASO. They seem to be different . I always follow the JISAO one, it’s the original, the NCDC one was designed to match it. Surprising that they no longer match, especially given the sentence I’ve highlighted above. My post to you was truly a question, not in any manner as an accusation. I used the word “conpiracy” when I shouldn’t have, and your explanation based on my original question was given in an most thorough manner, and now I more fully understand that you are talking about processes of data gathering, not intent. The odds on Intrade are very good forecasters. For instance, they have been skeptical that any country would leave the euro this year — the odds only briefly got up to 24%. It now looks as though the euro block is going to make extraordinary efforts to avoid breaking up. But that wasn’t at all clear a month ago, when it looked like one or more departures was likely. However, the odds at Intrade aren’t set by the organization itself, which is a mere marketplace where individual bettors posts bids and offers (sell-short bids, in effect) on certain propositions, similar to bids and offers placed on the stock market. (I.e., the bettor specifies the price level and quantity of his bid/offer.) If a bid or offer is tempting enough to another bettor, he “covers” it, and the price at which he does so establishes the latest odds. For instance, on the Greater Arctic Ice This Sept.? proposition, I currently have a bid at 40% for five $10 “contracts.” (All contracts are for $10.) I had to post a margin of $20 (40% * 5 * $10 = 20). If someone wants to take my bet at those odds, he posts a “sell” order at 40 for 5 and posts margin of $30 (60% * 5 * $10 = 30). In October Intrade settles the bet one way or the other and places $50 in the winner’s account. That’s one nice thing about the site — the feeling that I’m punishing the other side (not a bookie). A new record. The most asinine, meaningless, quote from him ever. Nothing is said, because all bases are covered (obliquely). Everything in the paragraph above is complete and utter nonsense. Moving on…. Have said it once, twice, three times a lady: Listen more and speak less. Your posts have nothing substantive to offer and they are merely sophistry. Not good enough! But for someone who has an answer for everything, talking out of his arse with “doublespeak”, like the paragraph above, then I lose total respect. Hey R….go and read “1984.” If it convicts you, and you can man up, then “props” to ya. If it has no effect, then…well….so be it. Prove me wrong though. Will give you the benefit of the doubt. Yup. The uncertainty reminds me of Tisdale’s posts on here about the PDO really being a statistical artifact of ENSO. The cycle is there…its just not as clear-defined as we’d like….no? Can’t believe I did that, oh well I’ve been very busy lately and rush rush rush everything. One year, or two or five, of lower sea temperatures does not have any bearing on the global warming hypothesis as a whole.